Montgomery: Garthbeibio, Hirnant, Llandisilio, Llandrinio, Llanerfyl, Llanfair Careinion (3), Llanfechan, Llanfihangel, Llanfyllin (2), Llangadfan, Llangyniew, Llangynog, Llanrhaidr yn Mochant, Llansaintffraed in the Hundred of Deythur, Llansaintffraed in the Hundred of Pool, Llanwyddyn with Cowny, Myfod (2), Pennant. Denbigh: Carreghova, Llanarmon mynidd Mawr, Llancadwallader, Llangedwyn, Llanrhaidr yn Mochant. The population falling within the Union at the 1831 census had been 19,537 with parishes ranging in size from Llanarmon mynidd Mawr (population 164) to Llanfair Careinion (2,687). The average annual poor-rate expenditure for the period 1834-36 had been £8,497 or 8s.8d. per head of the population. 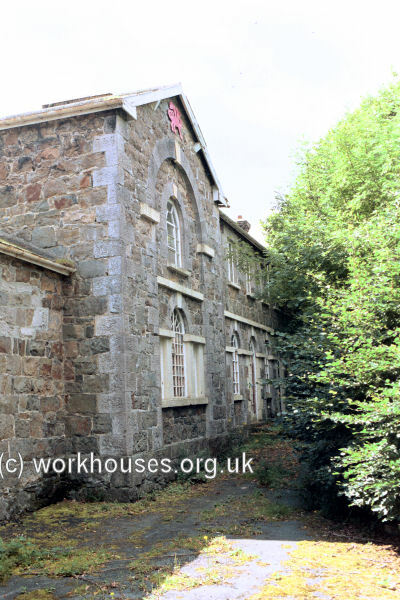 A new Union workhouse which became known as "Y Dolydd" was erected in 1838 at the south-east of the town. 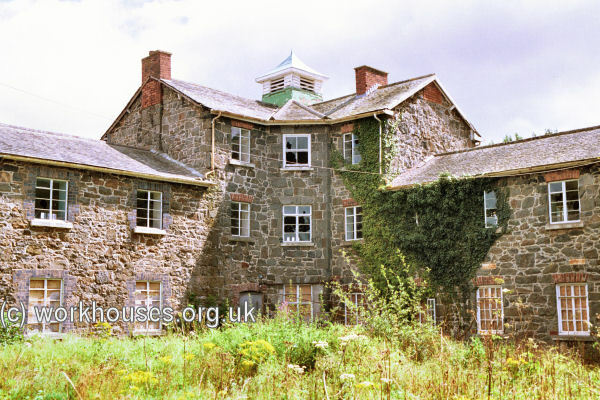 In the same year, opposition to the new workhouse system in the area led to a mob setting out from Llanfair Caerinion to destroy the building but the Montgomeryshire Yeomanry prevented this. The new workhouse was designed by the County Surveyor, Thomas Penson. The Poor Law Commissioners authorised an expenditure of £5,267.10s. on construction of the building which was intended to accommodate 250 inmates. The layout of the workhouse followed the popular cruciform or "square" plan published by the Commissioners in 1835. 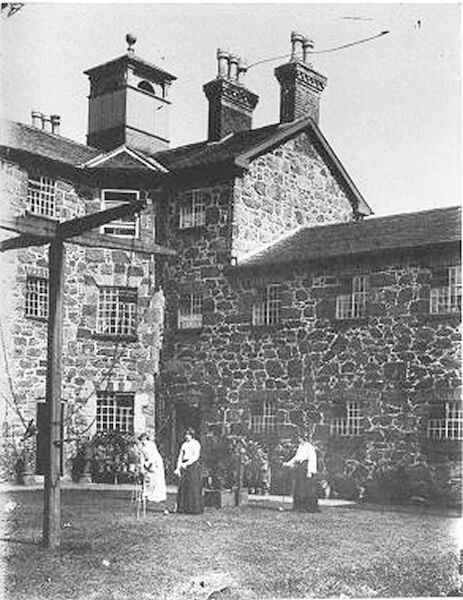 At the centre was a supervisory hub from which radiated separate accommodation blocks for each of the different classes of inmate. Llanfyllin general view from the south, 2000. 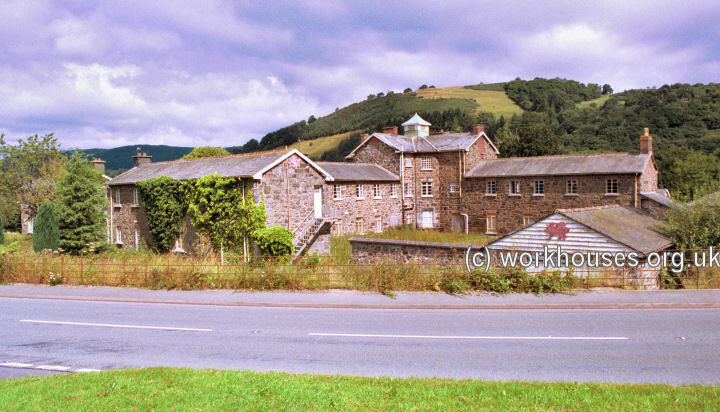 Llanfyllin from the south-west, 2000. 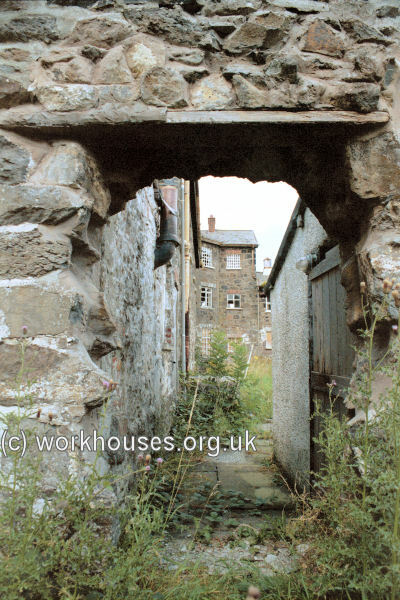 The workhouse Master's quarters were in the hub and its windows were arranged to provide good views in all directions. The areas between the wings were used as segregated exercise yards for the inmates, although the west yard appears to have been used as the Master's garden. Llanfyllin west yard, date unknown. The north-west side of the workhouse which faced back towards the town had a rather more elegant appearance than the rest of the workhouse and featured round-headed Venetian windows. Llanfyllin north-west side from the north, 2000. A garden party, perhaps to mark a Master's retirement, gives a rare group portrait of staff and inmates. Llanfyllin garden party in south yard, date unkown. 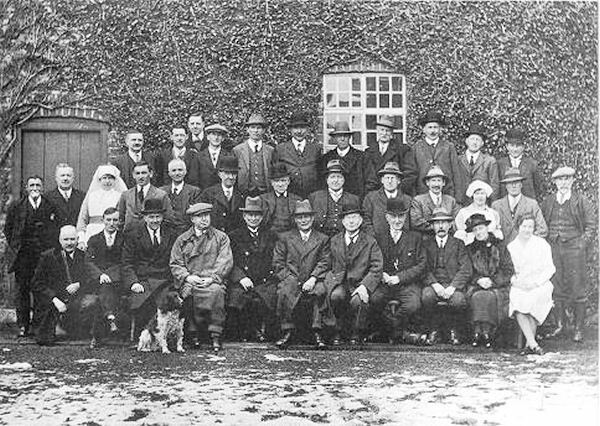 The Board of Guardians who ran the union met for the last time when the workhouse system came to an end in 1930. Llanfyllin Board of Guardians, c.1930. Across the road from the workhouse was a small cemetery in which most inmates would be buried in unmarked graves. 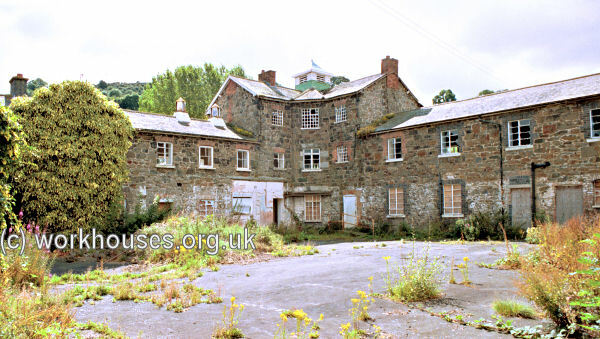 The workhouse later became an old people's home called The Meadows (the English for Y Dolydd). 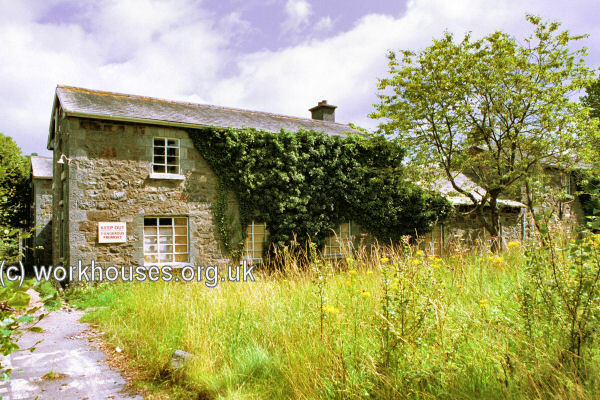 From 1966 until its final closure in 1982, it was managed by Mr and Mrs Bowen. The site is now in private ownership. A scheme to turn the buildings into an activity centre was abandoned following the death of its then owner in an accident at the time of its opening. By 2000, the buildings were lying empty and overgrown. The building was then acquired for development into a business centre but after featuring in the 2004 series of the BBC's Restoration programme, ownership passed to the Llanfyllin Dolydd Building Preservation Trust. The Trust plans to become "a leading force in the integration of education, arts, entertainment, and employment using a holistic and sustainable approach based upon sound social and environmental principles." 1881 Census for Llanfyllin workhouse. Powys County Archives Office, County Hall, Llandrindod Wells, Powys, LD1 5LG. Holdings include: Guardians' minute books (1841-1930); Ledgers (1861-1930); Register of inmates (1885-1974); Births (1914-41); Deaths (1914-72); Creed Registers (1909-39); etc. Llanfyllin — a Pictorial History by Richard Kretchmer (1992, Powysland Club / Llanfyllin & District Civic Society).